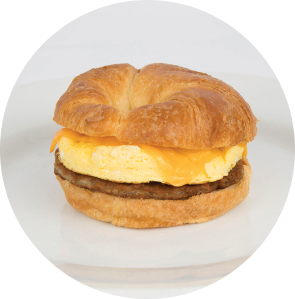 Margarine Croissant (Enriched Flour (Wheat Flour, Malted Barley Flour, Niacin, Reduced Iron, Thiamine Mononitrate, Riboflavin, Folic Acid), Water, Margarine (Palm Oil, Water, Soybean Oil, Sugar, Soy Lecithin, Mono- and Diglycerides, Potassium Sorbate Preservative, Citric Acid Preservative, Natural and Artificial Flavor, Beta-Carotene Color, Vitamin A Palmitate), High Fructose Corn Syrup, Contains Less Than 2% of Each of the Following: Yeast, Salt, Whey, Calcium Propionate Preservative, Calcium Sulfate, Dextrose, Sugar, Wheat Flour, Maltodextrin, enzymes, Natural and Artificial Flavors, Ascorbic Acid Added as a Conditioner, Acacia (Gum Arabic), Benzoyl Peroxide, Calcium Phosphate, High Oleic Canola Oil, Capric Acid and Caprylic Acid Triglyceride Blend), Pork Sausage Patty (Pork, Water, Salt, Spices, Dextrose, BHT, Citric Acid, Propyl Gallate), Egg Patty (Whole Eggs, Non Fat Milk, Modified Food Starch, Salt, Xanthan Gum, Citric Acid, Pepper), Cheddar Cheese (Cheddar Cheese (Cultured Pasteurized Milk, Salt, Annatto (color), Enzymes), Natamycin (a natural mold inhibitor), Soy Lecithin (non-sticking agent)). Contains: Egg, Milk, Soy, Wheat. Check out our latest product guide featuring all of our newest products. See something you like? 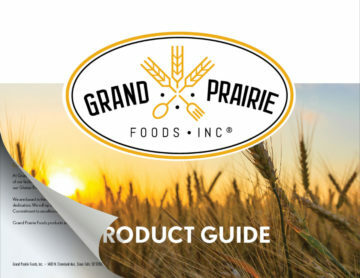 Grand Prairie Foods products are available through Dot Foods or your local distributor. Family is at the heart of how we produce food. From our people to our food – they are what inspires this business every day. Commitment to excellence is a part of every facet of Grand Prairie Foods – quality food is what we do. We are devoted to providing our customers with the best quality cuisine. Our passion doesn’t stop at quality food but reaches outside our doors. We are committed to giving back to the community that has been so good to us. We provide our customers quality, delicious food while maintaining a gold standard of quality. Check out our line of products. We have delicious food options for nearly every industry with the capability to custom create what you need.